Cloudy with periods of rain. Thunder possible. High 69F. Winds SSE at 10 to 15 mph. Chance of rain 90%.. Rain and scattered thunderstorms overnight. Low 57F. Winds ESE at 5 to 10 mph. Chance of rain 100%. 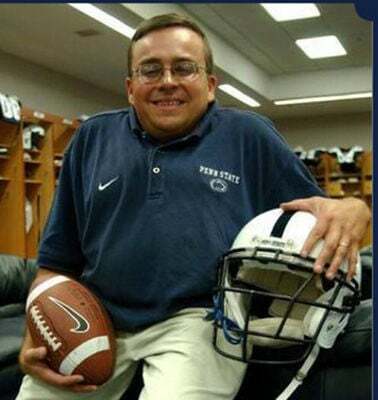 Curwensville native Brad Caldwell had a long career as an equipment manager for Penn State Nittany Lion football, beginning as a student manager and retiring in 2014 as director of equipment services. After a brief hiatus, Caldwell returned to Penn State where he is the facility coordinator for Beaver Stadium. STATE COLLEGE — When people visited Beaver Stadium, home of Penn State Nittany Lion football, Saturday for the annual Blue and White game they likely didn’t know that there’s a little piece of Clearfield County at its heart. The stadium’s facility coordinator is a native of Clearfield County. Brad Caldwell grew up in Curwensville, attended Curwensville Area High School where he graduated in 1982 and still comes back home on occasion to visit family that lives in the county. Caldwell said it was his eighth grade science teacher who inspired his career. When it was presented Keely jokingly told Caldwell not to forget who started him out as manager. “He also turned and pointed to his wife, who was pregnant at the time, and said I hope that kid turns out to be half the kid you are.” In a strange turn of events, Caldwell said Keely’s son Joshua Keely works for NASA in missions control. Caldwell graduated from Curwensville and began attending Penn State University, DuBois campus, studying aerospace engineering. While at the DuBois campus, in 1983 he learned of an position as a student manager at the school’s University Park campus in State College. He said Domico had recommended him. He quickly transferred to University Park, although he had to change his major because of the time commitment. He graduated in 1986 with a degree in recreation and park management – a year Caldwell remembers fondly because he was the head student manager the year the Nittany Lions won the national football championship beating the Miami Hurricanes. In 1987, Caldwell was hired as the assistant equipment manager and in 1999 advanced to head equipment manager where he remained until June 2014 when he retired from the position and moved to Vermont, with his wife, ready to enjoy life at a slower pace. “I retired with mixed emotions. The best part of the job was all the great people I met and worked with over the years, also the traveling and seeing different parts of the country. I loved going to the away games and the 23 bowl games that I was fortunate enough to be a part of,” he said. After a health scare and a nagging feeling that he couldn’t seem to shake about his decision, Caldwell quickly realized he had not been ready to leave the Penn State fold. At the end of 2014, a job opened up as Beaver Stadium’s facility coordinator and Caldwell applied and got the job. As facility coordinator, he takes care of special events at the stadium – making the arrangements for weddings, meetings and banquets. “I am like a social coordinator. I make the arrangements. I work with the caterers and set up for events. I oversee the maintenance. My work is mainly in the south end of the stadium where the suites and offices are,” he explained. Cloudy with periods of rain. Thunder possible. High 69F. Winds SSE at 10 to 15 mph. Chance of rain 90%. Scattered thunderstorms in the morning. Partly cloudy skies late. High 68F. Winds SSE at 10 to 20 mph. Chance of rain 40%.